For many years I have tried to find a Desco rebreather. These units are relative rare in Europe. Desco made a A, B and C lung. I have been looking for a C-lung as my holy grail, although Max Nohl his helmet would be even better ;). I was fortunate to find a Buccaneer Lung or B-lung. 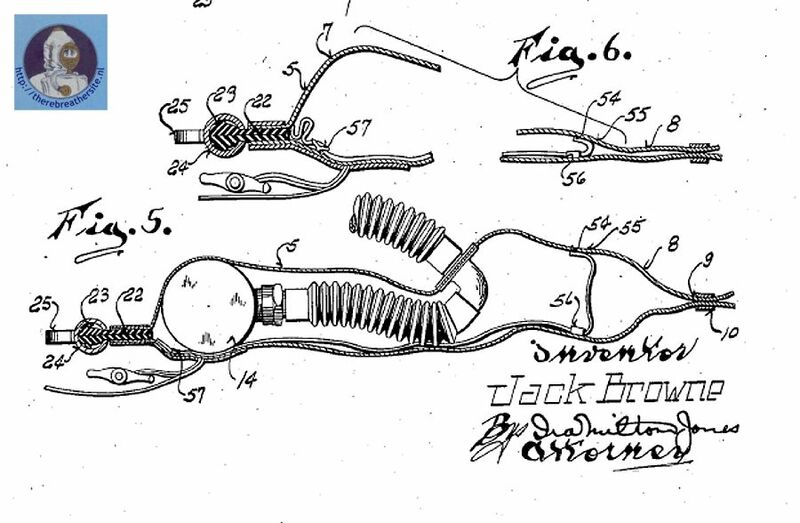 This page tells you about the history of this lung and his designer Jack Browne. 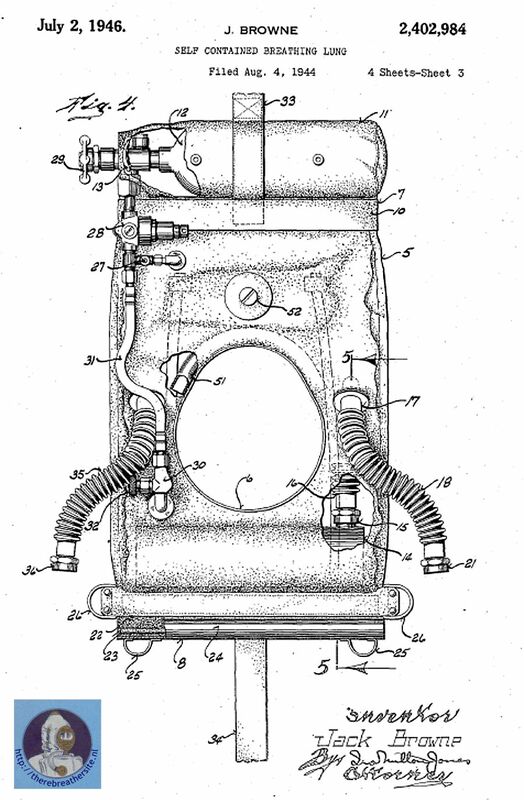 I have made a tear down of this wonderful American oxygen rebreather. Please enjoy some diving history. The shown B-lung was made in 1944 during World War II. Jack Browne was also a survivor of tin can diving as a boy. His father was an executive with the Goodrich Transportation Company in Milwaukee. Jack became interested in diving while a freshman in high school. He would take on jobs for pay or just dive for fun. 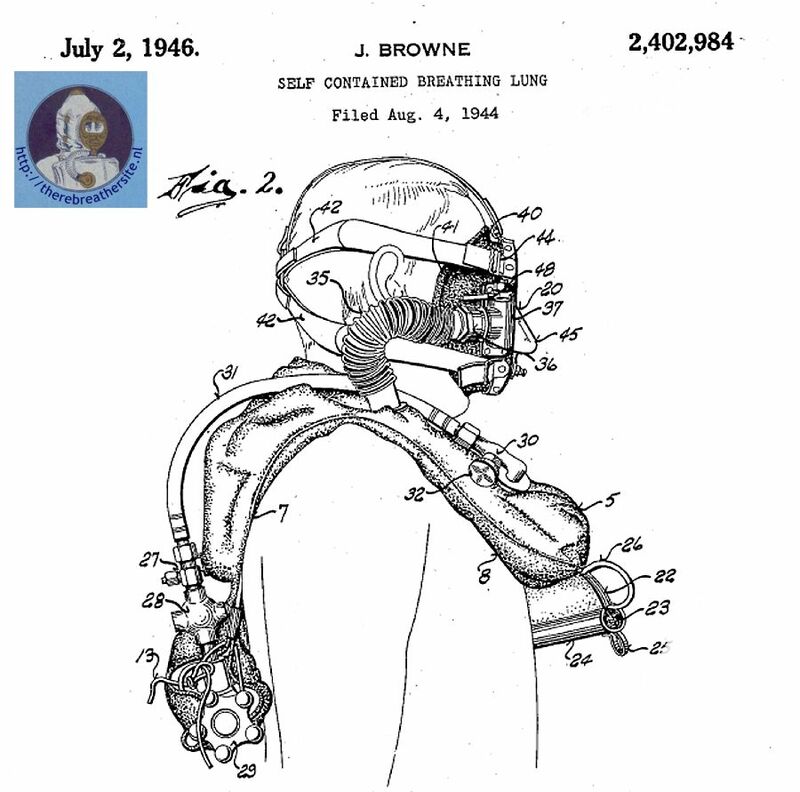 He also had a knack for invention and his first diving helmet was literally a tin can. In 1934 he was working with Max Nohl diving on local wrecks. diving helmet in a Shorewood swimming pool. When Max Nohl and John Craig began work on the equipment for the Lusitania salvage Jack was ready to pitch in. The custom diving dress they needed was stitched together from canvas and taken to the N.L Kuehn Rubber Company to be made watertight. he needed to be 21 years old. DESCO would not be formally incorporated until May of 1938 when Jack became “legal”. Mr. Kuehn signed on as Vice President, and a local attorney Earl Wanacek as secretary/treasurer. DESCO was located in the Kuehn Rubber Co. facility on north 4th street. Kuehn himself provided financial support and business advice. After the Lusitania project collapsed and Nohl and Craig had moved on to other things Jack determined to keep DESCO alive. Through 1938 to December of 1941 the small firm plodded along. 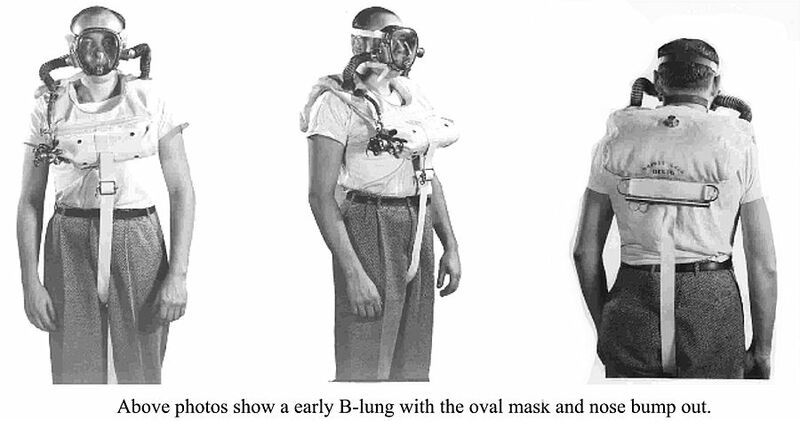 Jack experimented with new designs for breathing tanks and lighter suits. 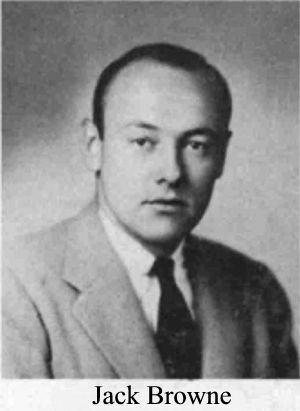 With the outbreak of World War Two Mr. Kuehn urged Jack to go to Washington. “Tell the Navy what you know about diving suits. Show the boys what you have done and can do.” Jack did. In January of 1942 he headed east and returned with a $5000 order for three self-contained suits. That first order led to others until DESCO was producing more diving equipment than anyone else in the world. Lightweight Diving Suit, and Buie Diving Helmet. Navy Doctor Albert Behnke worked with Browne and Dr. End on refinements in deep diving on Helium. Emerson Buie came to DESCO with his idea for a low volume diving helmet to deal with mine clearance in harbors. 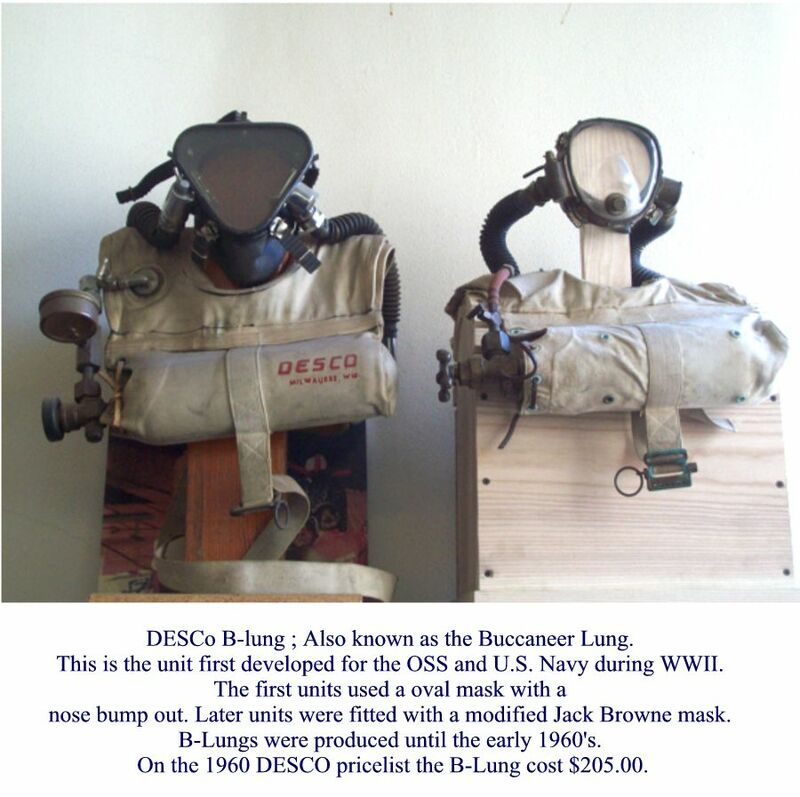 The US Office of Strategic Services asked Jack and DESCO to build them compact Oxygen rebreathers for covert operations. Along with special development projects was the day to day operation of a company supplying 80% of the country’s diving equipment needs. record depth of 550 feet of seawater. As in the case of Nohl's earlier dive, he breathed a heliox mixture under the supervision of Dr. End. Both dives were milestones in the development of modern techniques of mixed-gas diving. Max Nohl was asked how he felt about Jack breaking his record. Max replied "records are made to be broken". 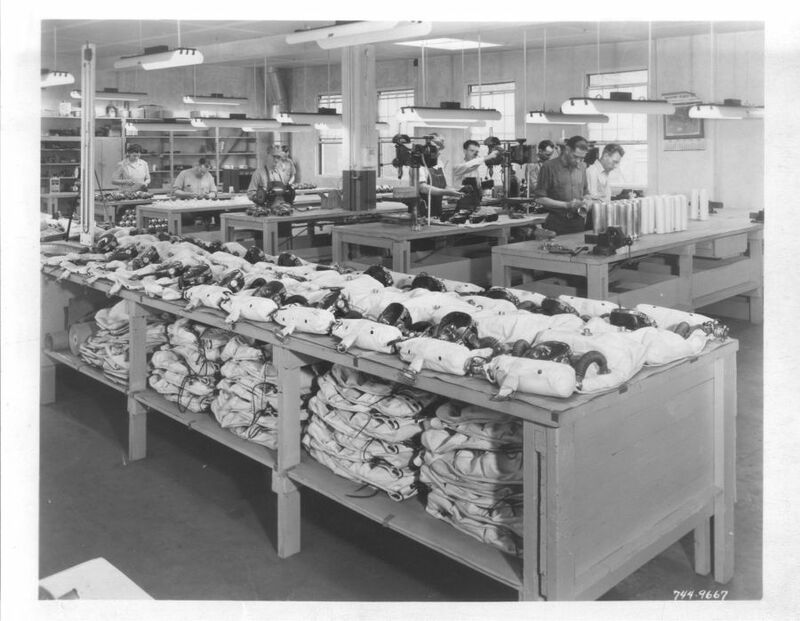 In 1946, Norman Kuehn and Jack Browne sold the company to the general manager E.M Johnson and a group of investors. Jack moved on to help run the family automobile dealership Browne Motors Chrysler Plymouth on 20th Street & North Ave. in Milwaukee. In June 1949 he became president of the dealership after his father George passed away. Jack makes the local papers occasionally, most notably for a bridge on the Fox River in Green Bay having to open so he could land his seaplane. He also made the paper with a story on the spider monkey he keeps on his yacht. Not much more was heard from him until 1958 when he is flying guns to Fidel Castro's Cuban rebels. He is forced down by the Batista Cuban Air Force and imprisoned. Browne managed to escape from prison and steal back his plane. On the flight to Florida he runs out of fuel over the Florida Keys. He was rescued by the Coast Guard. Jack retired to the Virgin Islands and passed away in 1998 from a heart attack. Source: with kind permission of the Desco corporation. 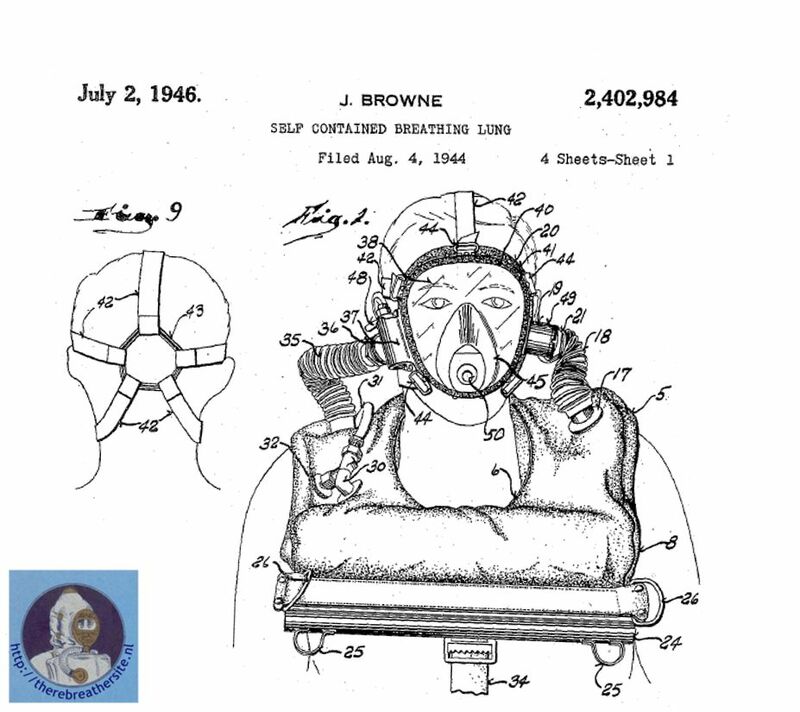 When I looked at the Browne patent, first thing that I noticed was the unit was designed with the counterlung in front of the diver! All photos show the unit with the counterlung on the back! 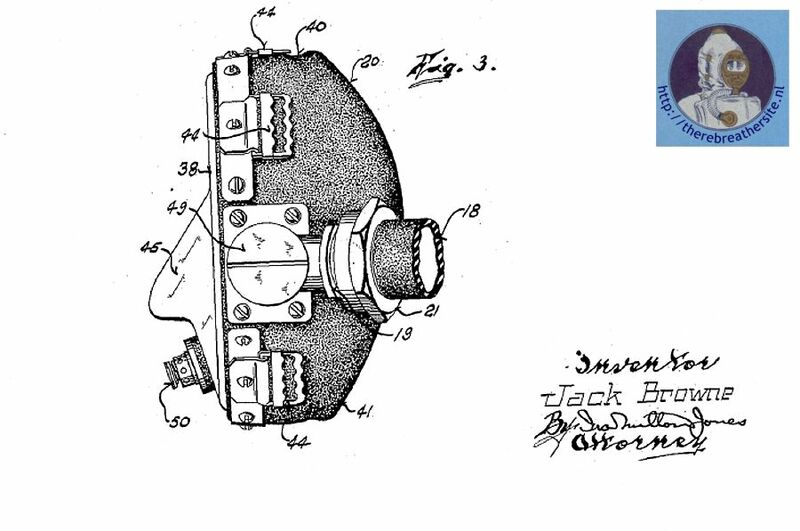 This is a very strange thing since there is also an extra valve placed on the lungside as shown in the patent. It looks if the unit was turned for the picture later. The following picture shows the unit in use as described in the patent! Finally my own desco oxygen rebreather! The beautiful made weight belt almost 70 years old!! After the clip has been detached the scubber can be taken out of the Counterlung. Inside the scrubber the exhalehose is attached to the scrubber. This is the only hose attached to the scrubber. length ~28 cm. Resulting in a 1,3 ltr scrubber. To modern standard as a rule of thumb 1 kilo equals 70 minutes so this scrubber could be working fine for 91 minutes. 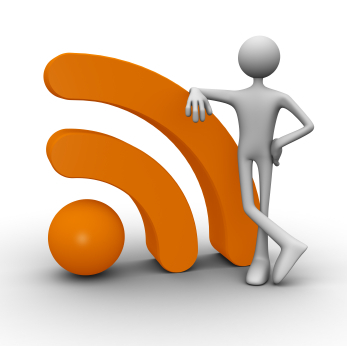 That equals the company's claim that the unit can be used from 1 - 1,5 hour. Please do not copy this figures for your design to built your own scrubber. The length to diameter and WOB has to be tested and is very critical! The closing mechanism is wonderful simple and effective! Inside there are two plates preventing channeling! The plates are fixed with one brass screw. The rubber has been hardened and the valve must be restored to work properly. 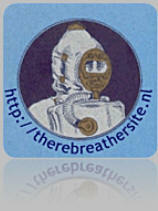 Early rebreather all have small diameter valves and hoses. This unit is no exception. Although the unit was used to 33 ft (10mtr) the work of breathing must have been relative high. Today diving to 10 mtrs on pure oxygen is not common and called very dangerous due to the partial pressure of oxygen of 2.0 bar! The mask of the B-lung is a piece of art. It has brass parts made with craftmanship and machines to very high quality parts. Valves are made extremely simple so every diver was able to maintain the mask themselves! inhalation valve and surface shut-off valve. The diver could shutdown the rebreathercyle by closing this inhalation valve and breath by using the purge valve in front of his mask. The factory also recommended to keep some water in the mask to clean fog inside the mask! My history person has come through! That is an old 300 series valve 1/4" MNPT on both ends, on the hose side it had an adaptor to accept the hose assembly as a push on, this was actually a bomber high altitude oxygen vest. The 300 series valves were manufactured by Hoke in Queens, NY by the Joseph Hoke Valve Company between the years of 1943 to 1949-1950. There should be some other data on the opposite face of the valve as well. I hope this helps. If you have further questions, please let me know.